My apologies for my initial error. "Today’s developer build includes quite a few bug fixes and refinement, especially for tabs and ad blocker. - The Never Stop Loading bug is fixed. - Tabs fixes in dark mode. - Fix for no favicons in Bookmarks bar. A special thanks to Regnas and M92 this week for pointing out these bugs to us. We appreciate you and all our users for keeping a sharp eye on any problems encountered". Has anyone seen notice of a new build in a blog post or here, gone to run Opera, gone to About, and been told that Opera is up-to-date (when it isn't)? At first, I thought it was because it's rolling out in a staged fashion, but the last several times I've merely refreshed the About page...and the build is found and immediately starts downloading. So it seems that there's an issue, at least here, where sometimes the first time you visit About, a new build isn't being found. Hi @rseiler, yes, this issue may occur in selected regions, because as I'm aware, the Opera's guys are testing new changes to the auto-update service. The problem should be gone in time, when the service is improved. Hi @alexs, yep, it's known issue. It seems, that there's only a workaround implemented, to avoids the crashes, but the problem remains, and needs to be fixed in one of the further releases. - Check out our new emoji in Snap tool. - Few sidebar extensions fixes. Chromium has been updated to version 64.0.3278.0. 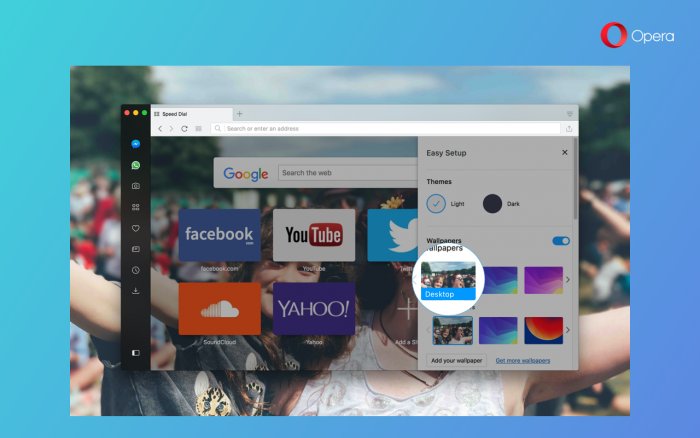 "To start off this week, we have an update for Opera developer 51, with two new features. The first is a workflow improvement, to quickly scroll to the top web page with just a click on the tab. Second, your active desktop wallpaper can now seamlessly blend into Opera as your start page wallpaper. Finally, the video pop-out button received a new design. Further below you will find notes about other changes and fixes. Enjoy! As you welcomed Opera Neon’s concept of a start page, that uses your desktop wallpaper as its background with such enthusiasm, we were compelled to introduce it in our browser today. Setting your desktop background as Opera’s wallpaper is as easy as adding your own theme from your system’s library. Head to the "Easy Setup" menu from the start page, and click the wallpaper option with the blue “Desktop” label across it. We all have read, and scrolled through an endless pit of web content, such as our Facebook, or Twitter feeds, or a busy discussion board on Reddit. These kind of pages leave us with a long climb back to the top! It’s then another long descent down to continue where we were. In today’s developer update, simple click on the tab will return you to the top of the page, and second click will jump back to where you were before. This boomerang-like action is handy way to quickly bounce between your current spot, and the top of the page, while preventing you from burning out your scroll wheel, or trackpad. Opera has undergone some stylistic touch ups in the past year, and now the video pop-out button receive a new look as well. You will find the new design in today’s update." Hi @alexs, you can try to use the latestopera-developer-ffmpeg-codecspackage (64.0.3278.0) from the Herecura's repo, without using any command line switches. Thanks @l33t4opera, this methods works. But I hope there is somewhere a public explanation for all how to integrate the customized libffmpeg.so (via script). On http://slither.io i have very a very low frame rate with new Opera Developer. WebGL is broken on Opera Dev build 51.0.2809.0? Hi @alexs, reading the information from the first link, you can see, that the Opera #2809 uses Google's SwiftShader driver, which means there's no hardware acceleration at all - that explains, why you experience now "low frame rate". In the previous build #2781 you used Nvidia driver for your GF9600 GT. Conclusion: most likely some update (probably forlibgl1-mesa-glxpackage) overwritten installation files of the Nvidia driver. If that is the case, you can try to reinstall the driver, and check if this fixes the problem. My OS Siduction (Debian/sid) is perfectly fine with the nvidia-legacy-340xx driver. Opera is a Browser not a operating system, right? I will return to Opera Developer when the Opera developers internal testing the linux builds before public this. Hi @alexs, the "SwiftShader" is mentioned in your first link above - lines 55-56. Are you sure, that the driver works fine? Please call the following command in the console: lsmod | grep nvi, does it display, that the "nvidia" driver is loaded? Please also run: glxinfo | grep dir, and check if it says "direct rendering: Yes". If it says "Yes", then there's a problem with enabling the acceleration in the browser. Launch the Opera, go to Settings > Browser > System, and see if the "Use hardware acceleration when available" is enabled. If it is, and the acceleration is still "unavailable" underopera:gpu, run the Opera with the switch as follow: /usr/bin/opera-developer --ignore-gpu-blacklist, and see if this helps. [    35.598] (II) LoadModule: "glx"
[    38.115] (II) Module glx: vendor="NVIDIA Corporation"
In browser settings the Hardware acceleration was enable. The command line option did not help. And yes, i testing with new profile. Just a note to mention that the latest build still will (eventually) insert about 10 branded Speed Dials and will (eventually) unset your default search engine back to Google's. @alexs @l33t4opera Hi. No issues for me on AMD GPU with mesa and even with proprietary driver. But in your case, from what I see in your log, you have "WebGL2: Software only, hardware acceleration unavailable". So this mean that Opera not use HW for WebGL2. Maybe this is your problem because your previous build have "WebGL2: Hardware accelerated"
So, try go to opera:flags and enable this flag - Override software rendering list. Restart browser and check again. Hi @angrypenguin thanks for the tip, but there not help. And i have previously tested with command line option. I have no more idea. What is the significant modify difference (program code) between Opera 51.0.2796.0 and 51.0.2809.0?